The State's formal recognition of Irish Travellers as an indigenous ethnic minority has been described as a "historic" day for Travellers and for Ireland. Taoiseach Enda Kenny made the announcement in the Dáil this evening. Mr Kenny said the statement of recognition will go some way to ensuring Travellers have a "better future with less negativity, exclusion and marginalisation". "The Traveller community has for many years campaigned to have their unique heritage, culture and identify formally recognised by the Irish State," he said. "Our Traveller community is an integral part of our society for over a millennium, with their own distinct identity - a people within our people." 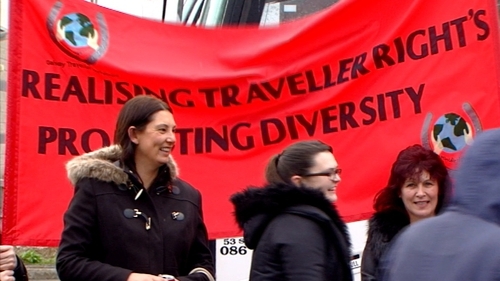 Speaking earlier on RTÉ’s Morning Ireland, former director of the Irish Traveller Movement Brigid Quilligan said the 40,000-strong community was overjoyed at the development and it would mean that their identity will be valued. She said currently in Ireland Travellers were seen as a failed set of people, and their history, language and culture was not valued. Ms Quilligan said while Traveller culture and distinct ethnicity was recognised by the settled population, it was seen as a negative thing rather than a positive thing. She said today's State recognition would change that. "We want every Traveller in Ireland to be proud of who they are and to say that we're not a failed set of people," said Ms Quilligan. "We have our own unique identity and we shouldn't take on all of the negative aspects of what people think about us. "We should be able to be proud and for that to happen our State needed to acknowledge our identity and our ethnicity and they're doing that today." President Michael D Higgins described the move as "momentous decision". "I have written to the Travellers organisations that have campaigned and worked on this issue for many years, to convey my congratulations and appreciation for their work. "I have no doubt that today's clarification will be of assistance in interpreting legislation in relation to Travellers' rights, and ensuring respect for Travellers' distinct identity within the fabric of Irish society." Before statements began in the Dáil this evening, three TDs asked whether proceedings could be suspended to allow more people in to witness the proceedings. Bríd Smith of the People Before Profit Alliance said she had asked staff in Leinster House if it was possible to open up the coffee dock and the party rooms to allow more people in. "The very least we could do is to make a plea to any settled people in the gallery to give up their seats for members of the Travelling community" she said. Sinn Féin leader Gerry Adams said more should be done so the "folks at the gate" could witness proceedings. He called for a brief adjournment to facilitate the large crowd. However, Ceann Comhairle Seán Ó Fearghaíl said it was not a case of space, but a case of personnel. He said the crowds outside the Dáil were "large and unprecedented" but there was not sufficient personnel to ensure proper health and safety conditions for everyone. The Ombudsman for Children Dr Niall Muldoon meanwhile said the recognition of Traveller ethnicity must be followed by real change. "The recognition of Traveller ethnicity has long been called for by the Ombudsman for Children's Office and others committed to tackling the serious challenges still confronting Traveller children in Ireland. "The recognition of Traveller ethnicity must be followed by concrete measures and timelines that will improve the situation for young Travellers.